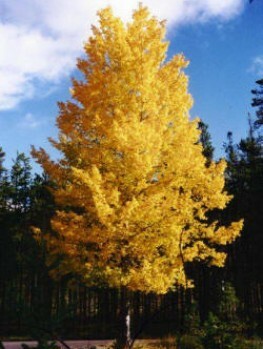 The Tulip Poplar is one of the most beautiful native American trees you can grow in your garden. It makes a gorgeous specimen with dramatic flowers in spring and yellow foliage in fall. Quickly grow into a lovely specimen for your lawn, or in the background at the end of your property. Large and unique flowers resemble tulips and create an elegant show every summer. 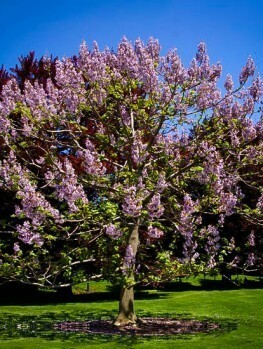 Grow this unusual and elegant tree and enjoy its beauty in your own yard. This tree grows well in most soils and will tolerate normal summer drought periods once established. It is free of pest and diseases and grows very quickly into an attractive tree you will be glad you have. 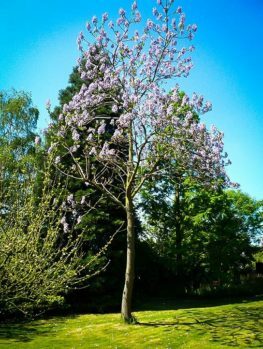 Admired by family and neighbours you will know that this tree is the right choice for your garden. Every garden needs a beautiful tree. 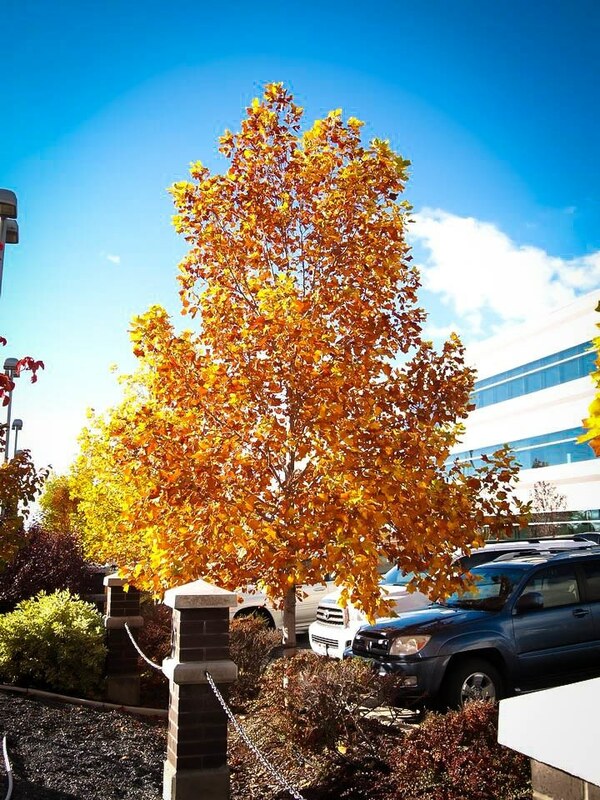 There are many trees that can be grown but choosing this American tree is a terrific choice. 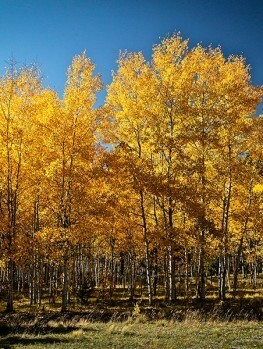 The leaves are unique in shape, large and turn a lovely yellow in the fall. Unlike most shade trees, the Tulip Poplar has large flowers in the spring which make a lovely display. It grows quickly into a shade tree to cool your house, patio and garden and will be admired at all times of year. 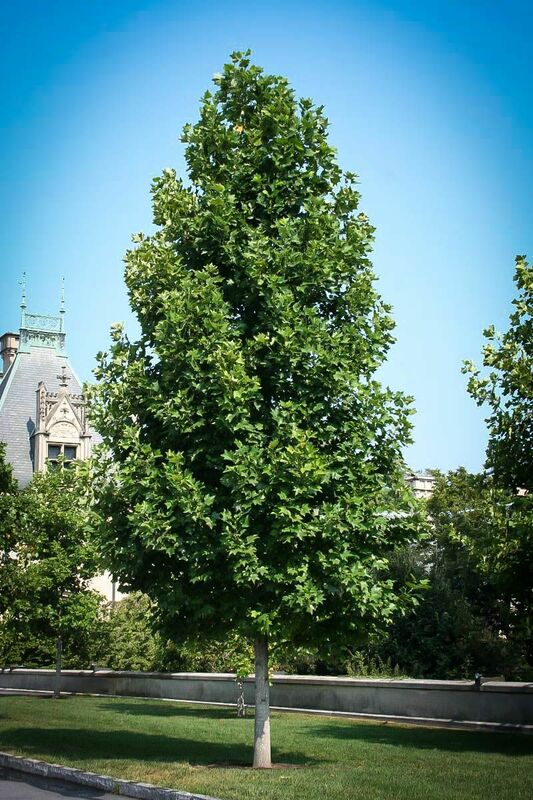 Tulip Poplar will grow about a foot per year or even more, which is a good growth-rate for a specimen tree. Since a young tree is six or ten feet tall when you plant it, that means you will have a twenty to twenty-five foot tree in just ten years. Unlike many quick-growing specimen trees it will not break in storms and will live for many, many years. 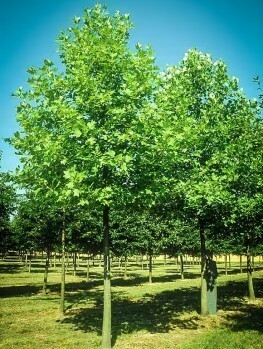 There are no serious pests of diseases which affect the Tulip Poplar, so it will enjoy a long, trouble-free life. It does not tolerate severe drought, but once established it will be happy in a normal dry summer. Water well once a week in the summer for the first year or two and your work will be over. 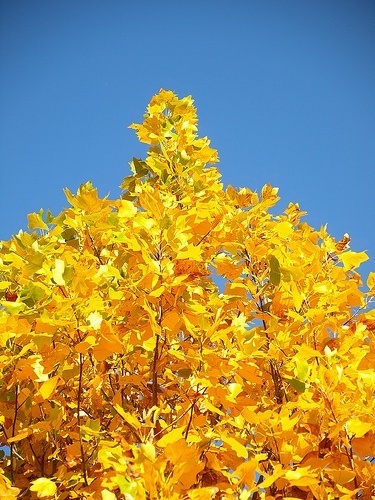 This tree is hardy in zones 4 to 9, so the Tulip Poplar grows throughout America, except for the coldest parts of North Dakota, Minnesota, Wisconsin and the tip of Florida. This is a tree that everyone can grow and love. Pruning should be done in winter and very little or none is usually needed. Remove any dead or broken branches neatly and any branches which cross or rub against each other. 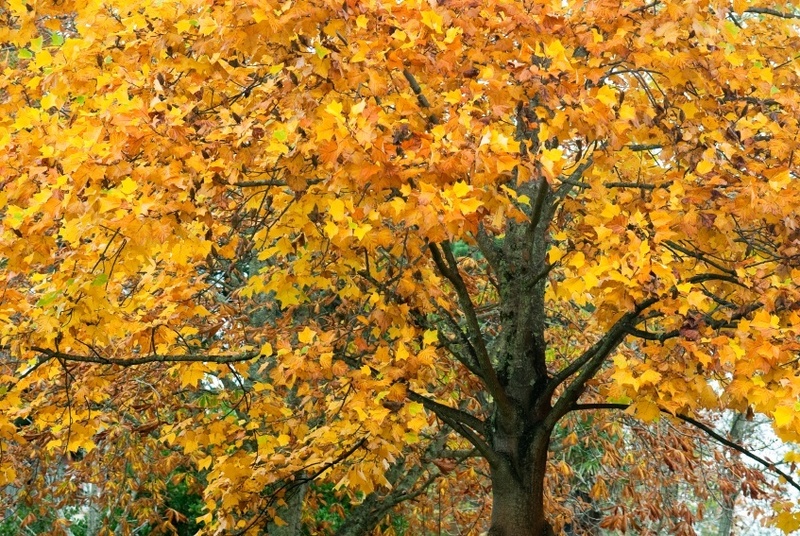 Thin, weak branches in the center of the tree can be removed to develop an attractive open crown on your Tulip Poplar. 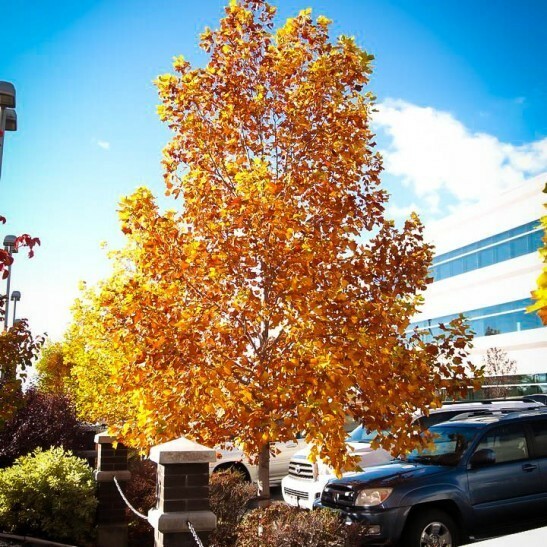 Tulip Poplar is normally grown as a single specimen, although it could be planted in a row to make an attractive screen, or as an avenue along a driveway. As the trees grow large in time allow ten to twenty feet between them for a screen or avenue. Dig a hole two to three times the diameter of the root ball and mix in some organic material such as compost, rotted manure, rotted leaves or peat-moss. Just make the hole the depth of the pot and break-up the bottom a little. Add some starter fertilizer like superphosphate to get your tree of to a strong start. After you put back most of the soil, firm it well around the roots, water very thoroughly and after the water has drained away fill in with the remaining soil. Staking is not usually necessary. This tree is best in a sunny location providing shade for you or shade-loving plants in your garden. It does best in deep, moist soil and will even tolerate short periods of flooding. However, it will grow very well in ordinary garden soil of almost any kind except for extremely sandy soil or permanently wet soil. When young it will benefit from regular watering and fertilizer in the spring to get the quickest growth. The Tulip Poplar (Liriodendron tulipifera) grows wild throughout the eastern United States. It was prized by Native Americans for its long, straight trunk and was the most popular tree for making dug-out canoes. It was one of the first American trees introduced into England and caused a sensation with its unusual leaves and even more with the beautiful flowers that make it so unique. It is the state tree of Indiana, Kentucky and Tennessee. The Tulip Poplar is a beautiful tree to see. When covered in flowers it is a real beauty. During the fall, its leaves turn butter-yellow the effect is spectacular. Even in winter the intricate twigs look beautiful against the sky. This is a tree to plant for yourself, your children and for future generations as it can live 300 years. Mature trees can be 70 feet tall or more, with a thick trunk and grey-brown bark with shallow ridges. When grown in the open it has a broad crown but in more crowded locations the trunk will be tall and straight. Unlike most fast-growing trees the wood is hard and branches will almost never break in storms. The leaves are large, almost six inches long and unusual in shape. They are a little like a maple leaf, but less spikey and the end is blunt, as if someone has taken scissors and neatly trimmed the leaf tips. They give the tree an attractive appearance. The flowers make this tree very special. They are four or five inches across, yellow to green in color with a prominent central cluster of stamens. They sit upright on the branches and may be very numerous. They are followed by a cone-like structure of seeds that will fall in October. Although the Tulip Poplar can be grown from seed, the resulting plants will be variable in quality. 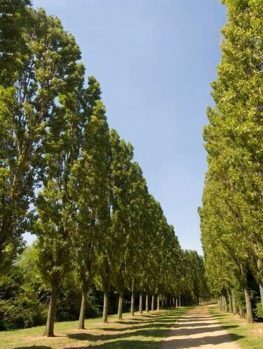 Our trees are grown the correct way, from branch cuttings taken from the very best specimens. 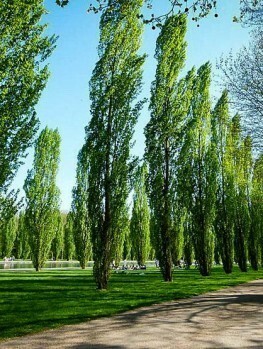 That way every tree is identical to the original and produces a very uniform effect when grown in groups. However this takes longer, so avoid cheaper, seedling trees that will only be a disappointment. We sell only trees that are true to the original form and we have a wide range of sizes to give you the best plant for your purpose. However we are constantly renewing our stock so our customers get fresh, healthy plants, so supplies of this tree may be limited. To avoid disappointment order now.